Secondary Inscription: (Verso) inscribed "Martin Schoen" in graphite. An executioner holds his sword aloft, ready to slice the baby, while one woman frantically grabs his arm, begging him to stop. Hans von Kulmbach showed the dramatic climax of the story in which the wise King Solomon was asked to judge between the claims of two women who had each given birth to a child at the same time. When one of the babies died, both women demanded the remaining infant. To determine the truth, Solomon ordered his guards to cut the living child in half and give a portion to each. The real mother then rushed forward to prevent the act, so that her child might be spared. 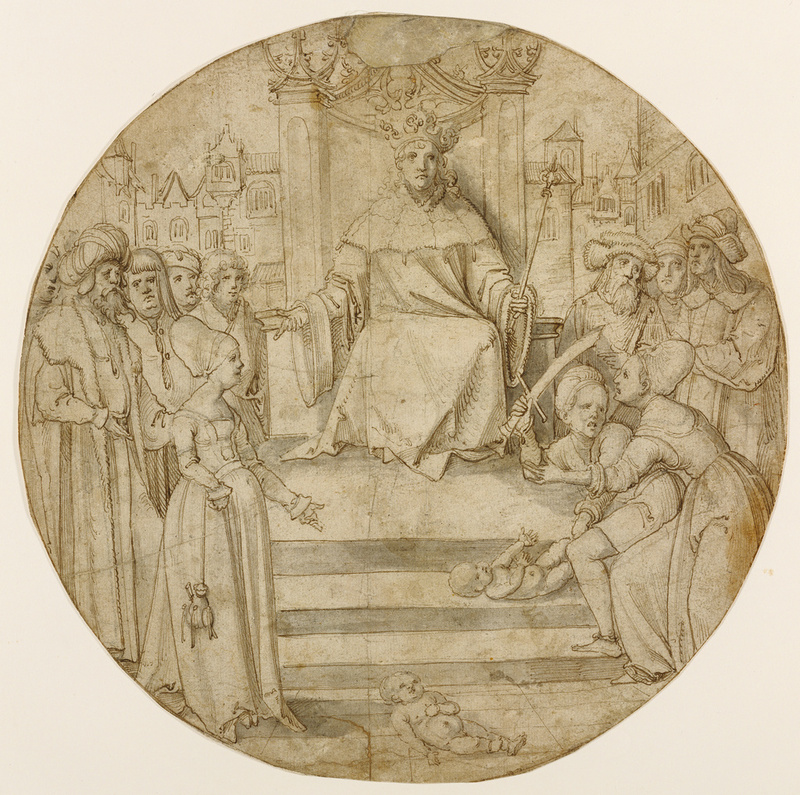 Onlookers with beards and exotic headgear, looking much like Renaissance European Jews, observe the scene, while the other mother points to her dead child lying at the foot of the stairs. In this design for a stained-glass window, Kulmbach sketched the scene with a brush and wash before reinforcing it with ink lines. After the artist had produced such a design, known as a cartoon, a glass specialist then cut and painted colored glass in shapes and colors according to the design or painted the scene on colorless glass panels.